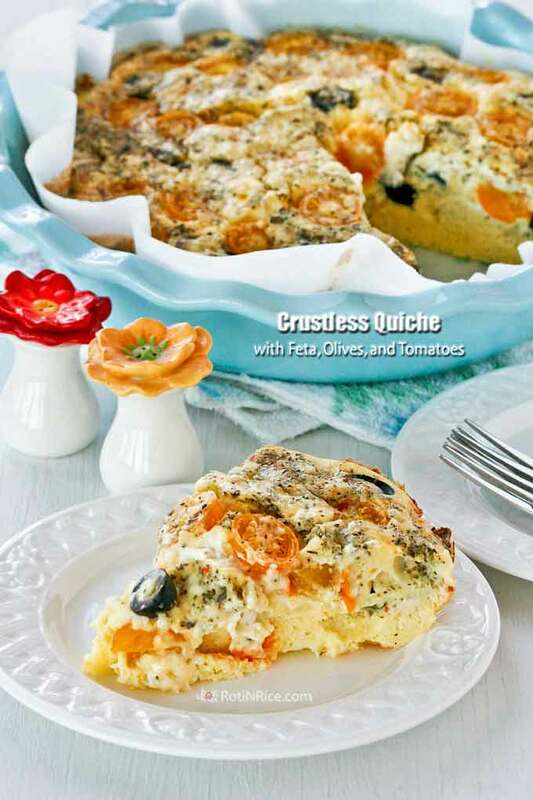 Treat your family to this creamy and fluffy Crustless Quiche with Feta, Olives, and Tomatoes. There is minimum prep time involved and it can feed up to 8. 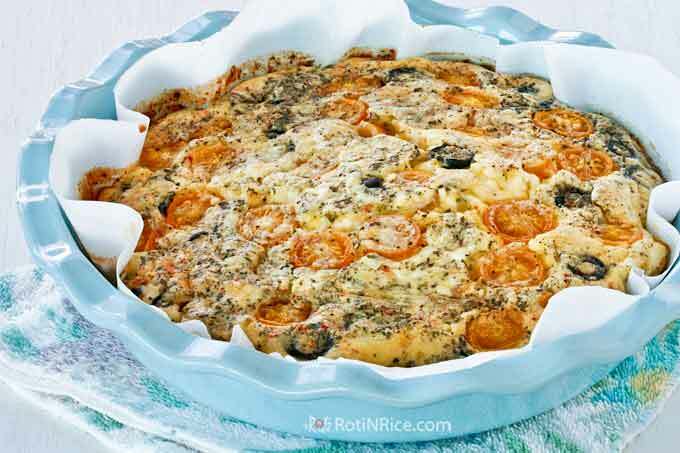 A quiche is a delightful dish to serve for breakfast or tea time during the weekends or when you have guests. One pan can easily feed up to eight persons and it beats standing at the stove frying bacon and eggs in the morning. Although it seems complicated to put together, it really is not especially when the quiche is crustless. But before we get on to the recipe, I would like to take a moment to tell you about my talented friend, Melissa who is also based here in Minnesota. 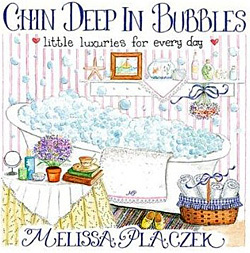 She is the author of Chin Deep in Bubbles: Little Luxuries for Every Day, a beautifully illustrated book of wonderful baths, facials, hair treatments, aromatherapy, delicious spa cuisine and more. It is a book every woman deserves. 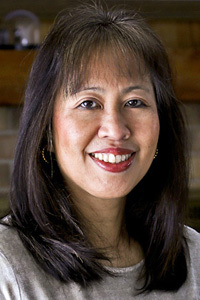 This past summer she also wrote and photographed two feature articles for Tea Time Magazine which will be published in the upcoming March/April and May/June issues. Melissa uses Bisquick, a pancake and baking mix for this recipe. I have to admit this is my first time using Bisquick and I had to run to store for a box of the Heart Smart, 0g Trans Fat version. This made the recipe even easier to put together. 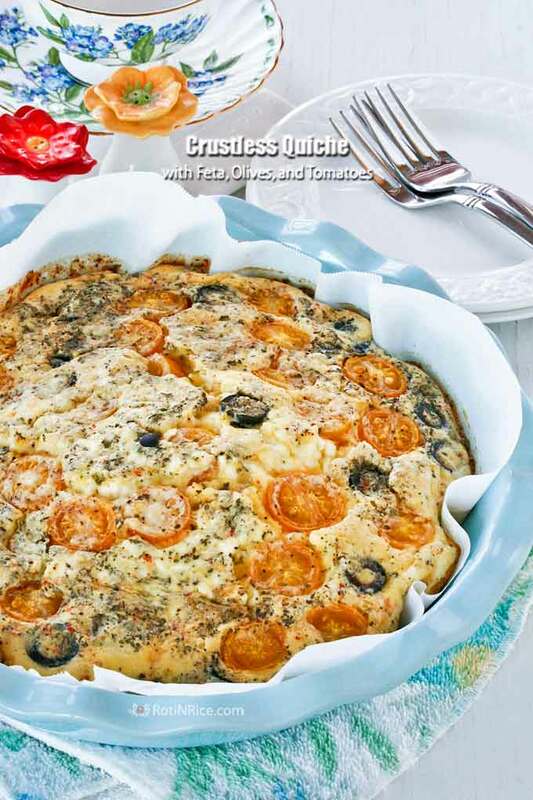 Many thanks Melissa for this delicious Crustless Quiche recipe. The quiche was fluffy, creamy, and fragrant. I love the combination of feta, cream cheese, and olives and enjoyed my breakfast thoroughly. You can be sure, I will be making this over and over again. Line a deep pie dish or quiche pan with parchment paper. Place feta cheese at the base of the dish or pan. Sprinkle sliced black olives and dried basil over the feta cheese. Beat eggs in a large bowl until foamy. Add milk, cream cheese, Bisquick, salt, and pepper. Continue to beat until well mixed. Pour egg mixture over feta cheese and black olives. Top with sweet golden tomatoes with cut side up. Bake in a 375°F (190°C) oven for 40 minutes or until eggs are puffed and top is golden brown. Yes, this one cooked really well and the bottom was not soggy at all. I like the combination of feta and olives too. Those sweet golden tomatoes made it even better. 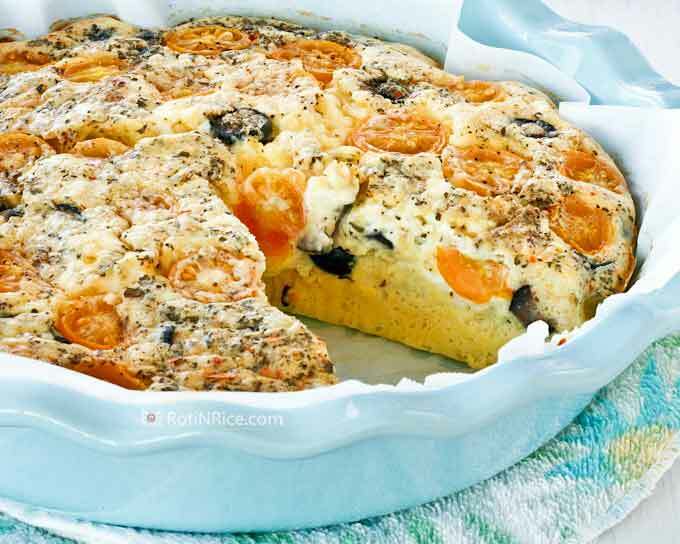 I haven’t had breakfast yet, and this gorgeous quiche is making my tummy do somersaults! I have never used Bisquick before either, though I see it every time I’m at the supermarket and I’m always curious about it. Btw, your sky blue dish is drop dead gorgeous! It’s my favourite colour and I think it’s an almost exact match to my Kitchenaid. Is it an Emile Henry piece? The Bisquick is really convenient and I am glad they have the Heart Smart version with 0g trans fat. I also used it for my Chai Gingerbread Pumpkin Waffles and they turned out beautifully. Bobby and I both love quiche but one 9″ inch quiche yields us two meals. We REALLY love quiche! 🙂 What a great breakfast or anytime quiche you’ve made here! You can’t go wrong with black olives and feta! Your pictures are gorgeous and really show how delicious this is! Love quiche and love it more is it is crust less. Glad to find your blog. Will be following. Bisquick is a pancake and baking mix. You can substitute 1 cup of Bisquick with 1 cup of all-purpose flour + 1½ tsp baking powder + ½ tsp salt + 1 tbsp unsalted butter. Hope that helps. like your blog and am surely going to try this recipe! Thanks for sharing. Where is the recipe ? I dont see it on this page. I like your individual one but wanted to make a full size.